Huge selection of bags, belts and filters for over 2,000 different vacuums. Choose from a variety of new vacuums to meet your specific needs. Personal instruction on the features of your new vacuum cleaner. FREE assembly on all vacuums we sell. Did you just repair your old vacuum only to decide that you should have bought a new one instead? No worries…we’ll give you a second chance! If you decide within 30 days of your repair that you’d rather have a new vacuum cleaner, bring your receipt in along with your old vacuum. We’ll credit the full amount of your repair toward a new Riccar vacuum. Don’t hesitate too long…second chances don’t come around often, so take advantage of this program and take home a new Riccar vacuum today! Customers want to talk with knowledgeable people in a welcoming, clean, well organized and friendly environment. And nearly 40 years later, in the same location, this family-owned business is obviously doing something right! In fact, Tom and Sandy Berkshire, owners of Stuart’s House of Vacuums, believe there are three building blocks to a successful business model: individual service, practical advice, and product selection. At the core of our operation is customer service. We strive to treat each person as our number one priority. 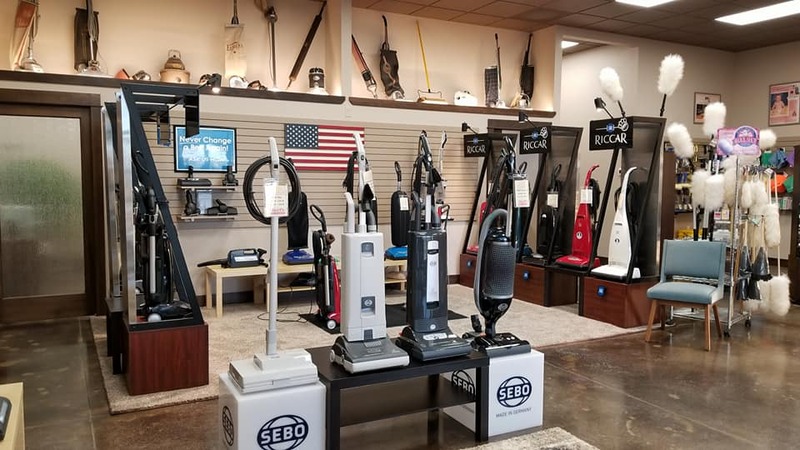 Whatever you purchase from us, whether a vacuum cleaner or a broom, you can be assured that you are going to get a great deal and terrific service after the sale. With over 50 vacuum cleaners on the floor and more than 4,000 vacuum cleaner parts (including belts, bags, filters and vacuum cleaner accessories), it’s almost guaranteed that customers will find what they need every time they visit. If you don’t see the item you need, just let us know and we’ll gladly order it for you! Whether your home has carpet, tile, stone, laminate or wood, all have one thing in common… they get dirty! Over the years, Stuart’s has expanded to include more than just vacuum cleaners, adding air purifiers, zone heaters, built-in central vacuum systems. Additionally, we offer a wide range of cleaning essentials, including products for granite, marble and stainless steel appliances. The employees at Stuart’s have many years of relevant experience in the home care industry, making them well qualified to assist customers in finding the best products and solutions for their cleaning needs. In those 40 years of business, we’ve seen nearly every imaginable model and variety of vacuum cleaner from the household name brand of Hoover (“It beats…as it cleans…as it sweeps”) and Eureka and Oreck…the door-to-door brands of Kirby, Rainbow, Electrolux and Compact…and those brands dominating the markets today like the German Miele and Sebo, the Italian engineered Lindhaus, Maylasian-manufactured Dyson and the American made Riccar. Family owned and operated; committed to the community! We have the experience and knowledge to help you make an informed decision. You may try any (or all!) of the vacuums in our store before you buy. We warranty any product we sell and all repairs are done on-site. Our selection of vacuum cleaners is the largest and most complete in Billings and the surrounding area. We look forward to meeting you and serving your needs!